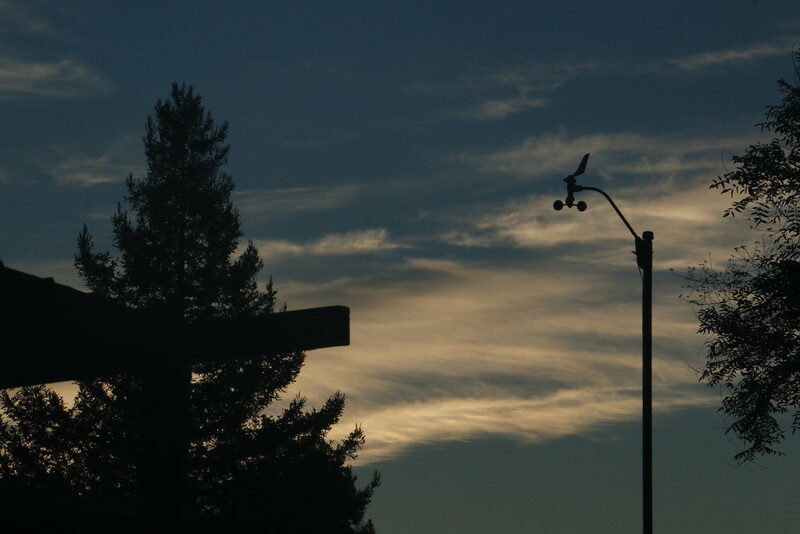 Late last week I noticed that my anemometer wasn't reporting any wind. I took a look and found . . . . this! So . . . grumble, grumble, grumble, . . . . 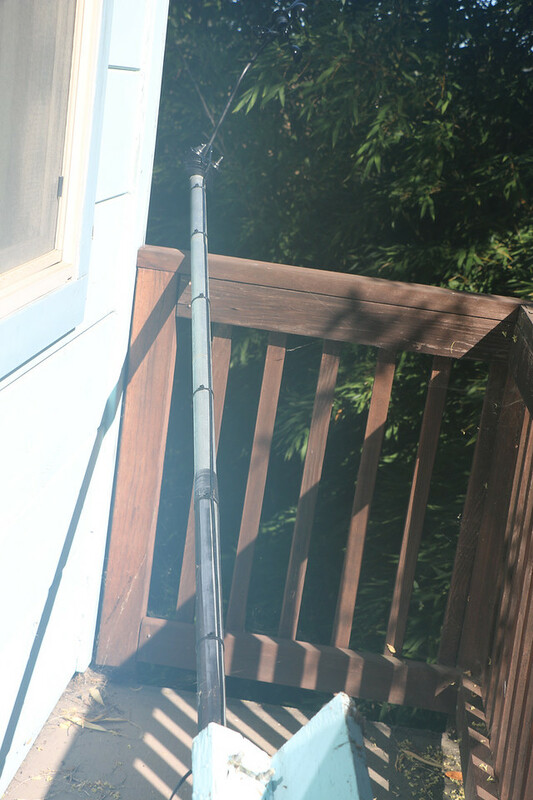 I grabbed a pole long enough to give the wind speed cups a kick to free them from the spider web. When I did this there was an ominous development - WeatherCat didn't report any wind speed. I repeated this procedure with sadly the same results. 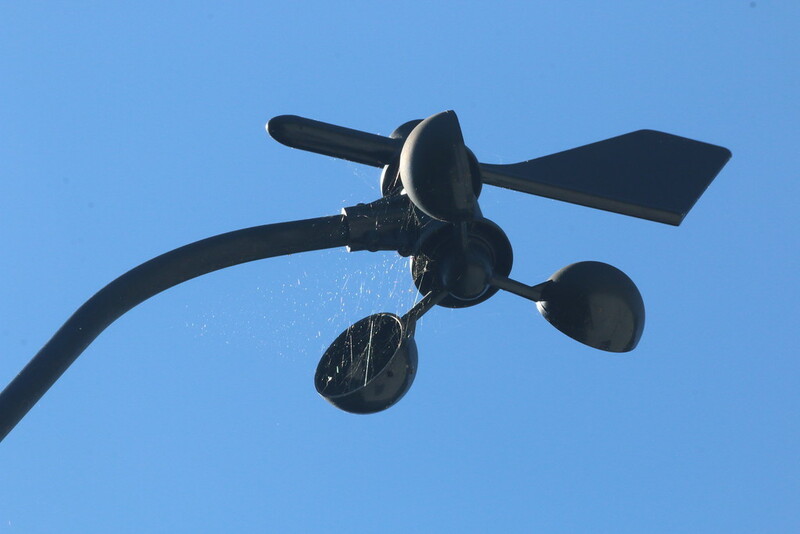 I don't know if the anemometer had failed before I gave it a kick or if my pole was too harsh and broke the mechanism. Either way I had lost my wind speed sensor. 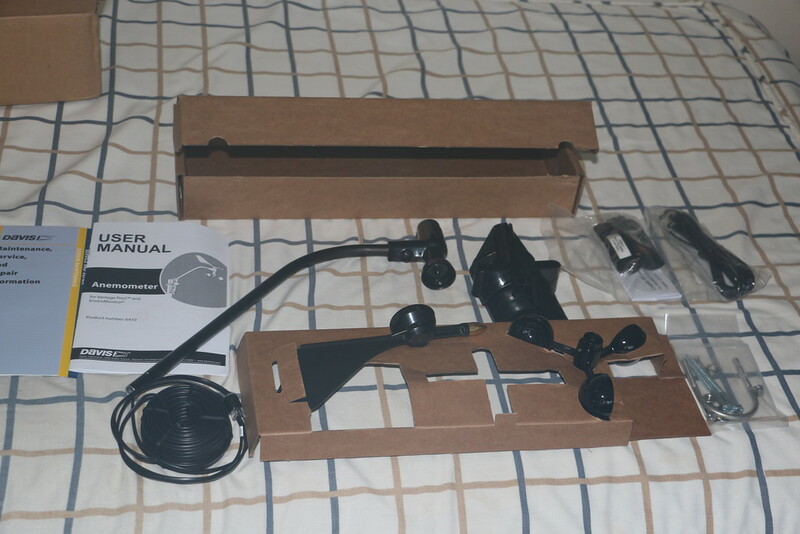 I paid the extra cost of having the anemometer shipped by the USPS next day air. It did arrive on time at a fraction of the cost of a private delivery company's price. 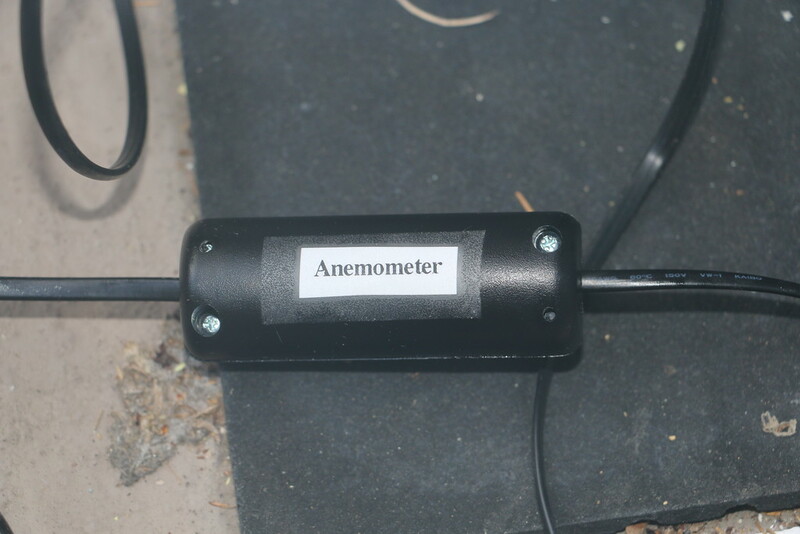 Unfortunately, my anemometer mast is secured to the house at a location that is full south and therefore extremely hot when in the sunlight. The days are getting shorter but the heat was such that I couldn't do this job much before 4pm when the mast was in the shade. I never intended to replace the anemometer so with some concern I tried to remove the wood screws securing the mast bracket on Monday afternoon. Fortunately, the bracket came free without any difficulties. 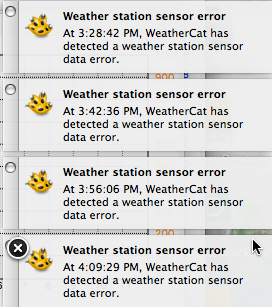 I was pleased to see this since this AppleScript has been fickle in the past to report sensor errors. At this point I had to splice the signal cables into the old 50+ foot long cable that runs from the deck where the ISS transmitter is located to the anemometer mast. I had to purchase an 8 foot cable to get the splice kit since Davis no longer sells the splice kit separately. Since the day was already running short, I just spliced the cables and stopped there. I'll have to come back later to place the splice in the Davis supplied housing. Before putting the mast back up I thought it was prudent to test everything and make sure the new anemometer was working properly. . . . . So I huffed, and puffed, and b-b-b-bblew at the anemometer cups! So much so that I caused a high wind warning!!! It is a polyurethane-based glue with some usual properties. The key property I exploit is that it is drawn toward moisture. 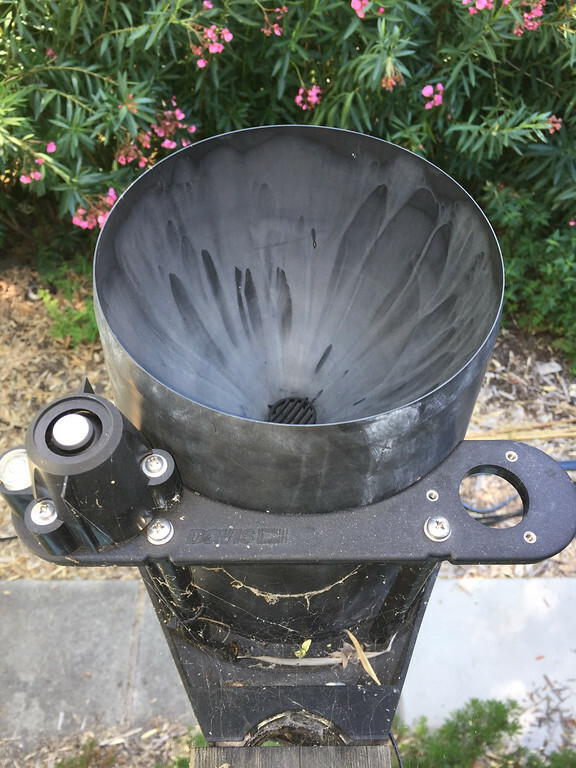 Before putting the anemometer mast back up I first squirted some water into the screw-holes and let it sit for a few minutes. I then put in a squirt of Gorilla Glue just before putting the mast back up and securing it with the wood screws. Gorilla Glue will be drawn into any spots in the wood where the moisture has reached and then expands forming what is a effectively a "chemical anchor" to secure the screw. Since our house was built in 1947 out of very nice but soft redwood, the Gorilla Glue effectively spreads the stresses to a larger region of the wood insuring that the mast will remain secure. So after 5 days, my weather station is once more able to dutifully report all the data expected of a Davis Vantage Pro-2! P.S. 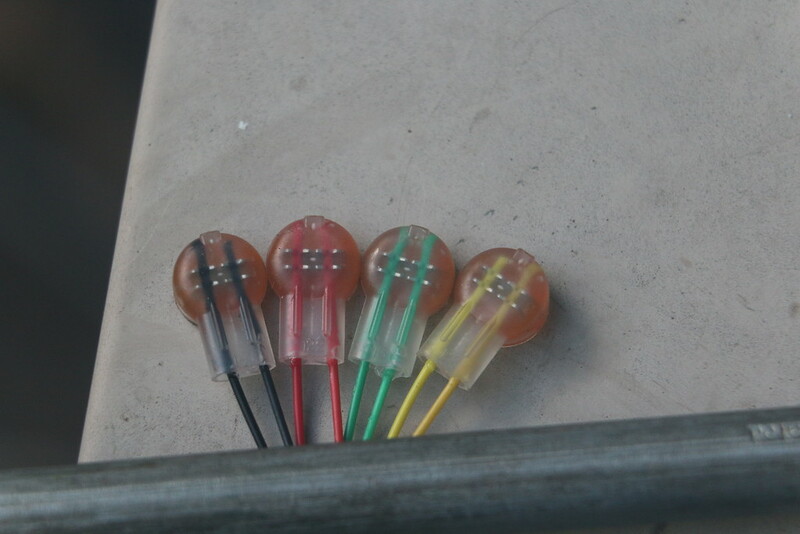 I will add a posting explaining how to use the Davis cable splicing kits as soon as that task is finally accomplished. Congratulations on a job well done! Although I think all you needed to do was to wax and buff the old hardware... surely you have some good wax around that wagon... oh well, hope you remember my 'tip' in 2027! Very informative. 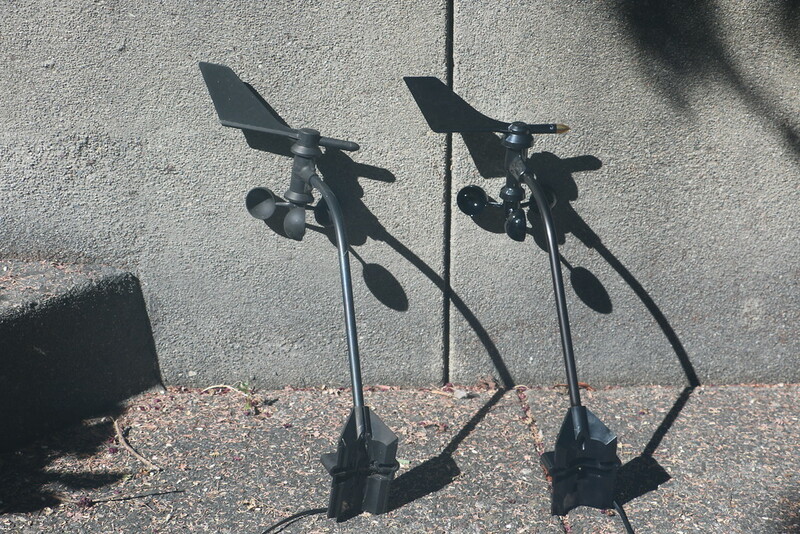 I have two anemometers, one at 33 feet and the other at 7. I will never be able to take care of the 33 foot one when if it fails. Yet it is the best location. Face it 71 with bad back isn't going to go that route. Sometimes the wind cups won't turn, some time they do . Considering they have been up there since 1993 probably some wear and tear on the bearings . However I liked the use of the Gorilla glue and how you have odne it. Our home is 1942 ,brick with a steel shingle roof, not a lot of opportunity to put up a replacement unit, so it is the 7 foot. We had a flood down the basement in June, well most of the city had it. My wife decided to call 1800 got junk and threw away my backup anemometer. Ray is a great resource of supplies. He has always been straight with me and great deals and advice. One of the advantages of living in the US. Well, . . . . . since turning the wind cups wasn't registering any speed I think it would take a wee bit more than a wax job. I did keep it just in case a repair was possible. 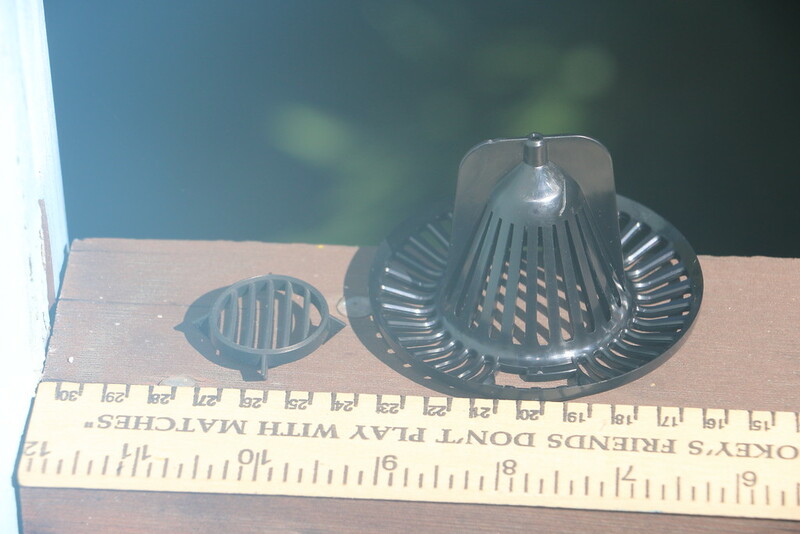 However, the mechanism is a mighty small device to fit in the space between the wind cups and the wind direction wane. Very informative. I have two anemometers, one at 33 feet and the other at 7. I will never be able to take care of the 33 foot one when if it fails. I understand your predicament. My anemometer is only about 7 feet off the roof as well. However, we are on the wind-sheltered side of a hill with tall trees all around. There was simply no point in my case to try to get actual wind speeds. I would need a 200 foot tower at least! However I liked the use of the Gorilla glue and how you have done it. Our home is 1942 ,brick with a steel shingle roof, not a lot of opportunity to put up a replacement unit, so it is the 7 foot. Does your house have plaster or sheet-rock panels for the interior? Our house has old-fashioned plaster walls supported by a steel mesh. I came up with the Gorilla glue trick because I couldn't find any other way to secure things to the walls or ceilings. Conventional anchors just crack the plaster. However, if you drill a hole and then wet the plaster around the hole, the Gorilla glue will expand into the gaps. If you leave Gorilla glue to cure in air you'll see that it expands very much like a foam insulation. So it really does spread into the plaster and make something that is substantially stronger than the plaster alone ever was. Ryan is a great resource of supplies. He has always been straight with me and great deals and advice. One of the advantages of living in the US. Other WeatherCatters have also had great experiences with the other discount weather instrument vendors, but I certainly whole-heartedly recommend Ryan Wilhour and Scaled Instruments. 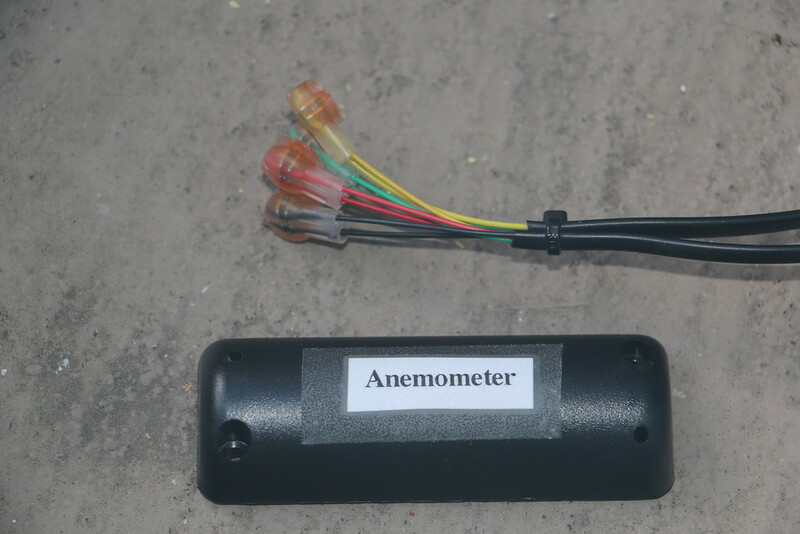 The photo of your new anonometer installed against the sky as a backdrop looks suspiciously identical to your old one. Below the spliced cables is 1/2 of the weather-proof housing. I printed a label to make it easy to identify which sensor is associated with this cable. I've had good success with printed paper labels and transparent tape. Although a more robust solution would be to use one of the original mechanical Dymo labeler. If you look carefully, you can see the sheen of the sealant on the edges of the box and on the outer insulator of the cables. My anemometer installation should now be ready for the rigors of winter. Edouard, you always do a really nice job of describing what you do and why. The photos are an extra nice touch. Thank you for taking the time to share this with us, as everyone will eventually have to replace their hardware components. Fortunately, Davis components are a lot more durable than the $100 weather stations you can buy everywhere. Edouard, you always do a really nice job of describing what you do and why. The photos are an extra nice touch. Thank you for taking the time to share this with us, as everyone will eventually have to replace their hardware components. 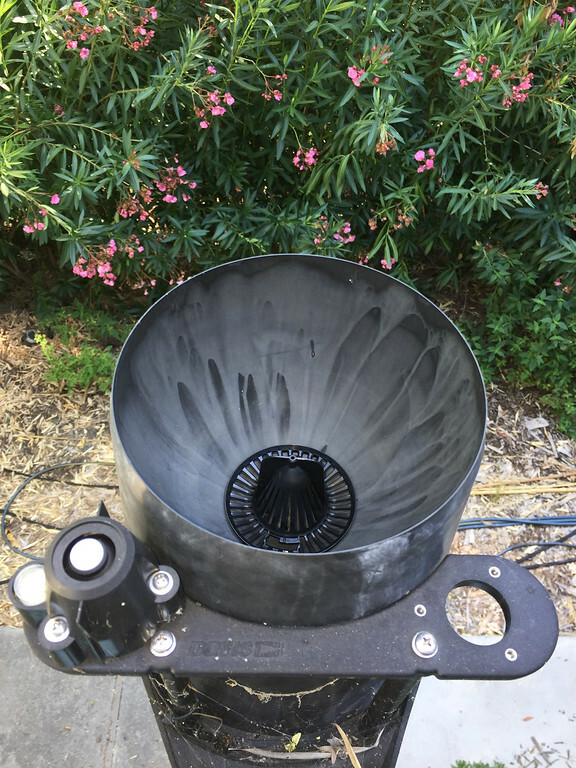 So has a number of more recent owners of Davis stations have attested, purchasing the upgraded debris screen is definitely something not to forget on your next weather instrument purchase list. I don't know how I missed this, but I didn't even know it was an option. Thanks for the info. Unfortunately neither provides any sort of free shipping which is why you should try to remember this item when you need something else for your weather station. I don't think my rain cone has grip grooves for those spikes. Are you using one of the new Aero style collector cones or did you just not install the spikes? Hey, what a great idea. I even have one of those sitting around somewhere. Thanks Weatheraardvark. I just noticed that the newest center debris protector has slots for mating with 'fingers' molded into the bottom of the collector cone. That's a feature missing on my 2015 collector. Good addition as I've found my center protector knocked over practically eliminated from doing its job. Those 'fingers probably come on the newer 'turbo' collector. Something to remember next time I need to replace anything.